Guest Post by Jenna Romano.Jenna, originally from New York, completed her degree in Museum Studies at Arizona State University. After working in Paris for a summer, she traveled around Europe and the Middle East until landing in Israel, where she began studying fine art at the Jerusalem Studio School and working in the tour industry. She currently resides in Jerusalem, where she enjoys being surrounded by the vibrant people & culture, and discovering the blossoming contemporary art scene. Inbal Mendes-Flohr’s exhibition “Pink Revenge” takes up only a small space, but the dialogue between the paintings and audience is huge. Displayed in the historical Jerusalem Artist’s House, it is one of four current exhibitions in this space. Wooden canvases fill the walls with bright colors, black humor, and a strong message for our audience to explore. In response to a recent Facebook initiative called “The Letter Campaign”, in which members replaced their profile pictures with the first initial of their personal name, Mendes-Flohr uses the feminine as a symbol for re-shaping identity. This movement defines the media’s constant influence in our lives, leaving much of our society struggling to identify and express its true self. 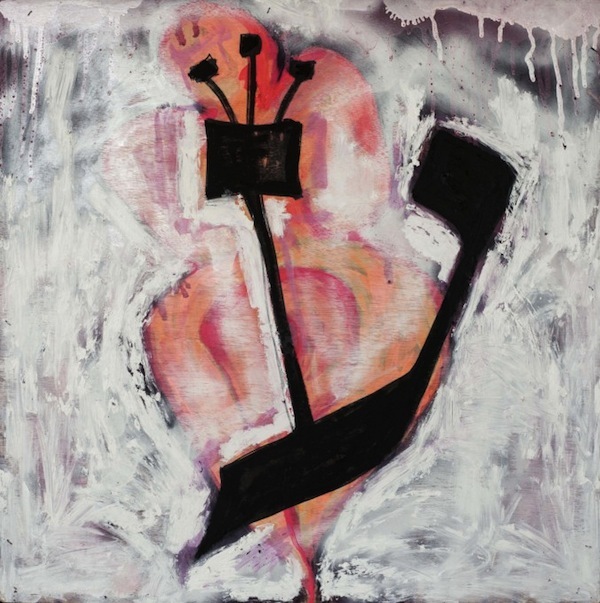 The artists own initial, “Ayin” hangs on the white walls, bold and black against a mystical female figure, promising us this form of dignity. 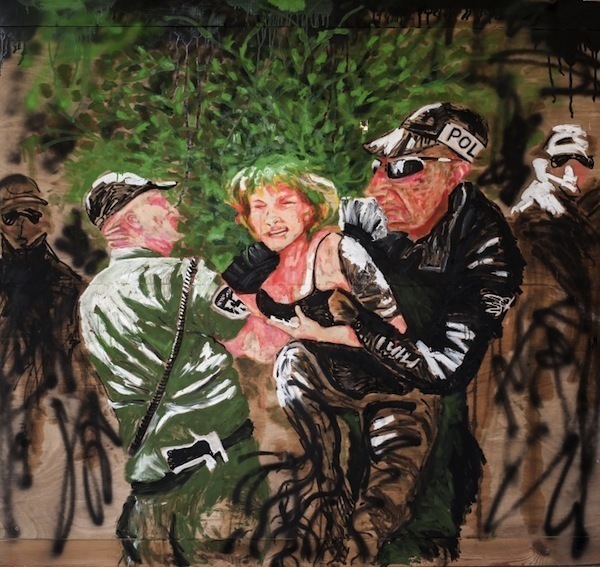 Mendes-Flohr’s bold display of figurative work plays with images of powerful and sometimes deadly women. Her intense portraits, juxtaposed with allegorical angels, skulls and of course, the color pink create a playful dichotomy. 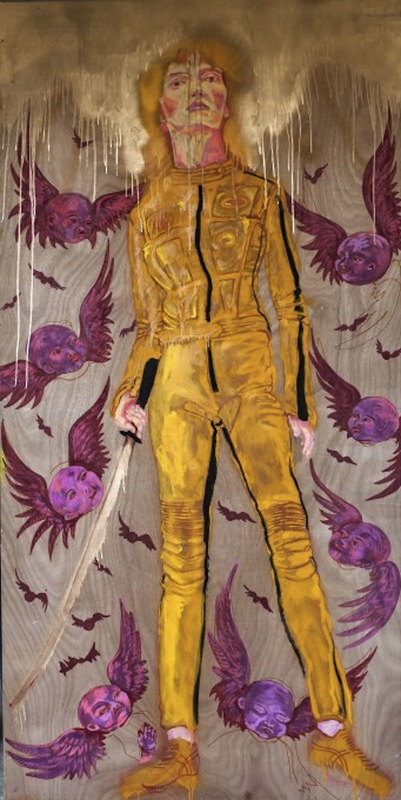 The artist’s use of wood, mixed forms of paint and other media places her work somewhere between the studio and the street, where we can appreciate the artist’s own modern, urban style. The exhibition is exciting and paints a vibrant of story identity, freedom and dignity. Mendes-Flohr’s passion speaks (and not only to women and feminists! ), telling us that true revenge is to claim our identity …let it be seen and heard! 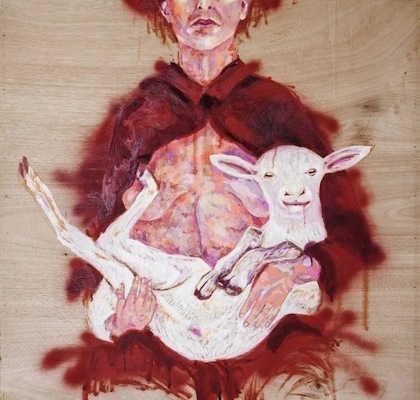 “Pink Revenge” can be seen until February 14th at the Jerusalem Artists’ House, a historical building that originally housed the “Betzalel School of Arts and Crafts”. *Photos courtesy of Jerusalem Artists’ House website.